Feast on this roundup of 4th of July recipes and party food ideas too fabulous to pass up on! With the Fourth of July just around the corner, you have to check out this list of 4th of July recipes and party food hacks. We'd have to warn you, though. This 4th of July recipes list will leave you wanting all, so check at your own risk! 4th of July Recipes For Throwing The Best Party Ever! For easy 4th of July dessert recipes, we give you these 4 super easy ones also perfect for kid's party. Get 3 easy fruit dessert recipes here, plus a fun fruit pizza recipe bonus! They say a lovely table setting boosts the appetite. 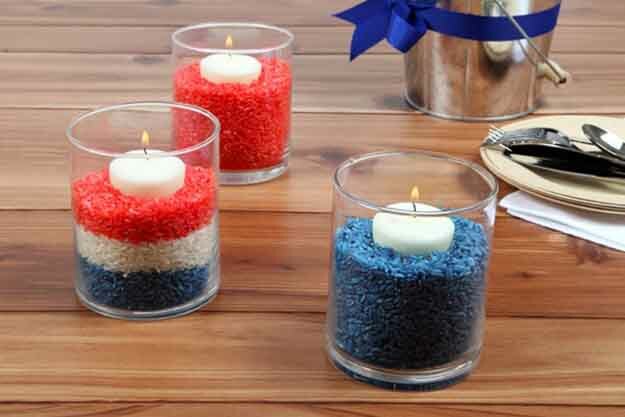 We are positive any of these easy DIY ideas for a 4th of July table decoration will do the job. It involves rice, after all! Make your deviled eggs fitting for the 4th of July festivities. Follow this easy appetizer recipe and paint it colorful for the occasion. Cheesecake is one of the traditional 4th of July foods. Make these cheesecake bars also 4th of July-worthy in red, white, and blue flag colors. Bubbly and fizzy, this 4-layered or colored drink will refresh kids and adult alike on a sunshiny 4th of July. It also comes with fireworks and pinwheel inspired straw idea. For 4th of July, use strawberries with blueberries to make these patriotic cheesecake parfaits. Make you cups extra festive by adding washi tapes to decorate. Unlike decorating for Christmas, I find 4th of July food prep easier. Take this easy fruit flag dessert, for example–you won't break a single sweat. Donuts are an all-American snack and a 4th of July party isn't fun without one. More so when the donuts are decorated as American flags. A 4th of July party is a one-day affair so keep those snacks coming! You can depend on this patriotic sweet and salty Chex mix to feed a multitude. Mason jars are not only dependable for 4th of July party decorations. They also make great food containers for mouthwatering summer treats! For 4th of July last-minute dessert ideas, turn to Oreos to save the day! To make these patriotic Oreo pops, only add cream or choco dip and sprinkles for a red, white, and blue party theme. It's 4th of July and we can't have enough of red, white, and blue. Even this pasta salad recipe is in red, white, and blue! Boost your appetite this 4th of July with these bacon cheeseburger meatballs. It's also an easy appetizer recipe for last-minute party food preparation. What's not to love about this red, white, and blue frosted cupcake oozing with a festive appeal? It is certainly one firecracker of a cupcake. 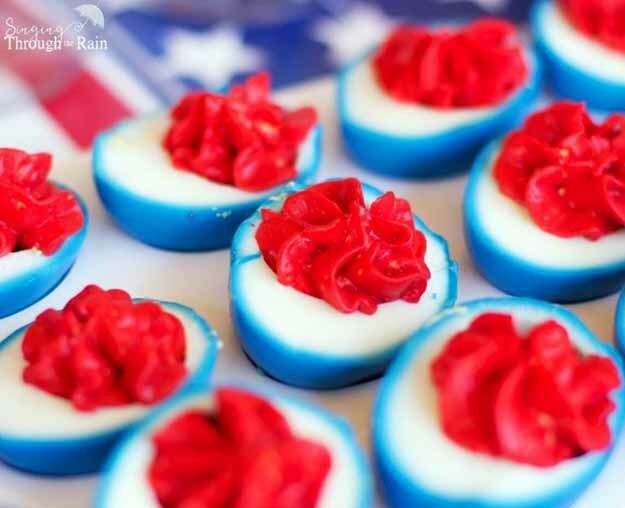 For easy 4th of July dessert recipes, make room for the red, white, and blue finger jello. It's one of the most popular 4th of July recipes which endured for generations. Nothing says Murca' like these sweet treats. It's a chocolate-dipped pretzel sprinkled in red, white, and blues you can make for July 4th. For easy 4th of July picnic food, you can rely on taco salad. Better yet, make this easy taco salad flag to get into the festive spirit. Keep the food coming on a sunshiny 4th of July party. We are positive this red, white, and blue trifle will sell like hotcakes among hungry party-goers. In the flag tradition, do this American flag vegetable tray. It's seriously one of the easy healthy fourth of July appetizers. Try mixing your favorite fruits like a true mad scientist with this awesome DIY sangria recipe! We promise it tastes as good as it looks. But do remember to drink responsibly! We're sure you want to make an American flag with fruits. So we give you this pretty nifty idea for an American fruit flag. Sweet finger foods are a hot commodity on a Fourth of July party. These mini berry cheesecakes with fresh blueberry and strawberry toppings will also sell like hotcakes. Crunchy star nachos and fresh fruits are sure hit with kids and adults alike. Serve them up with a dollop of cream or yogurt per serving. A party cocktail into the night is great with the 4th of July festivities. Make this cocktail concoction you can say cheers to the occasion. Even your chips can rise to the occasion! Take this chips and cheese dip recipe for a Fourth of July appetizer you can also snack on. A 4th of July party isn't complete without 4th of July cookies, at least for the kids. Make them these chocolate chip cookie dough with candy decorated flag. Who says 4th of July is only red, white, and blue? They can be colorful too with this festive July 4th BBQ 7-layer dip for outdoor parties. They are also perfect to go with any of your BBQs. This is a literal fruitcake perfect for an outdoor 4th of July party. Pretty refreshing and healthy both for kids and grownups to enjoy. A layered cake is a traditional American food for all occasions way before the Independence Day. It's only fitting and proper to serve up this fruit layer cake on the 4th of July. To make an American flag S'mores dip colored in red, white, and blue, use sprinkles in the iconic colors. It's a bit of work but it's a fun one we are sure you and your kids will enjoy. When we say ‘no-bake dessert‘, it means one dish off your hands to break a sweat over. Always have blueberries and strawberries handy to make any dessert perfect for a 4th of July party. Before we let the fireworks off, we'll have some fireworks first on the palate. These savory bacon-wrapped jalapenos will do the job. If you're in a fancy mood this Fourth of July, check out these fantastic mascarpone crostinis. It's a perfect breakfast to kickstart the 4th of July festivities. Corns are a mainstay in any outdoor party, especially during summer. But for the 4th of July, we're taking it up a notch higher. We're grilling corn with honey, mustard, and butter. Fourth of July-filled candy bars? How cute is that? Of course, they are one of the red, white, and blue entries kids and kids-at-heart loves. One of the foods we look forward to on a 4th of July BBQ are the hotdogs. Let your guests have a fill of whatever sauce, sausage, and toppings they love all set in a special hot dog bar. The wholesome peppermint patties have a Fourth of July version, too. Of course, they're in red, white, and blue! In the tradition of the hot dog bar, the burgers cannot be outdone. These tips, hints, and hacks for a burger bar in a 4th of July BBQ will help you out! Jellos are just adorable and a 4th of July tradition, so we have another adorable entry. This one is star-shaped and a bit tricky to pull off, so find out how here. A 4th of July outdoor party is not complete without fixin's, sides, and brownies, too. This brownie is in red, white, and blue also–all dressed up for the patriotic festivities. Even our favorite popcorn isn't spared for the festivities. This 4th of July popcorn just has to be in the colors, too! Remember those really silly Flintstones push pops when you were a kid? Here's a modern spin on your favorite 90's ice cream treat for the 4th of July! No, you're not going to color the potatoes in the iconic colors. You will find white, red, and blue Peruvian potatoes in the market for this delicious appetizer or siding. July 4th is traditionally hot so always have some cool refreshments on stand-by. This ice cream float is truly perfect for the occasion. Serve this refreshing drink in mason jars. You won't be sorry we suggested these pop rocks shooters! Your kids will be delighted and you will love it. Your palates will go pop-pop for the festivities, too. There you have it, DIY patriots! 4th of July recipes and food hacks you can pull off on your own. 4th of July recipes. Check! 4th of July food hacks. Check! We are positive, you are going to host an amazing Fourth of July party this year! Which of the 4th of July recipes will be making it to your 4th of July party food menu? We will be delighted to hear from you in the comments section below! Editor’s Note – This post was originally published on June 27, 2016, and has been updated for quality and relevancy.